he is in high demand as soloist, chamber musician, lecturer and recording artist. Born in the City of Cali, Colombia, Ricardo Cobo is the son of Lebanese immigrants who came to the Americas looking for a new life during the first half of the 20th century. His mother, a classical pianist and avid visual artist, taught him to play and read music as a child. His father, a brilliant surgeon who founded the first university school of medicine in Colombia, was a devoted concertgoer and lover of classical music. 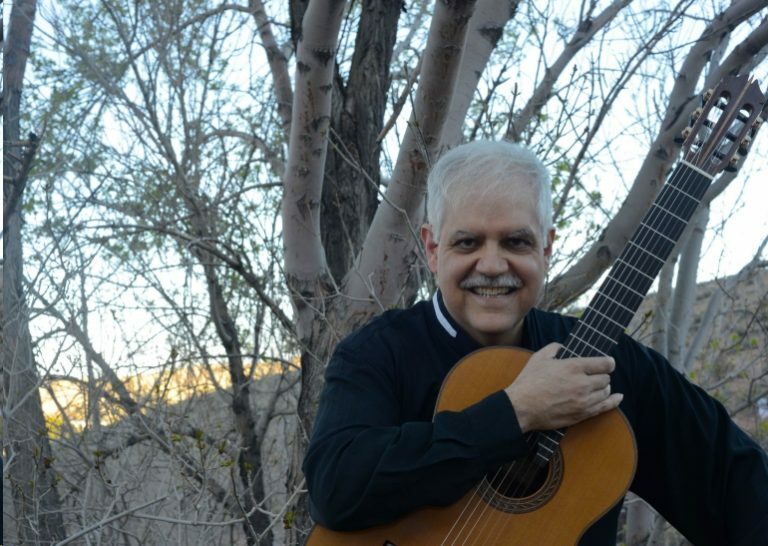 He instilled a fascination for guitar music in his young son while studying for his surgeries, which he prepared while listening to long hours of Flamenco and classical recordings. Tales for Guitar -ESSAY, Brouwer Solo Works-NAXOS and Guitar Lullaby- Ellipsis Arts, as well as his orchestral and crossover recordings in collaborations with jazz and classical musicians- Café 1930 with Marc Gould-Angel/EMI and Walking on the Water -ESSAY/Allegro. His Guitar Lullaby CD, currently on its third printing, was awarded the American Library Association’s highest recognition for children’s music as well as a Parent’s Choice Award and is widely regarded as one of the finest classical guitar audio experiences on CD. The enormous success of the Lullaby series also showcases Cobo on Papa’s Lullaby, Mediterranean Lullaby and Latin Lullaby. His world premiere recording of Leo Brouwer’s Guitar Concertos 3 & 4 (ESSAY CD 1040) has been called “compelling- a recording that cannot be too highly recommended and will not be bettered for some time to come.” -Fanfare. His most recent recording, Guitar Music From Latin America, is available on NAXOS (8.557 329) and includes Cobo’s remarkable arrangements of Latin American standards. This year’s releases include Festival Latino with flutist Alex Hawley on the Cambria label and Acrílicos , a collection of new music from living Cuban authors. Program: Leo Brouwer, Eduardo Martin, Jose Lezcano, Maximo Diego Pujol, Dilermando Reis, & Franz Castillo. Valet parking, inc.- $80/drinks/Full Buffet / Special Rush Pricing & Comps / We have only 10 tickets, so sign up NOW if you're interested.